In love with Formula 1: Australian GP: Sebastian proved to be the "best-of-the-rest"! Australian GP: Sebastian proved to be the "best-of-the-rest"! I had no difficulties to get up early (before 6 a.m. Finnish time) although it meant only having a few hours of sleep last night. I was restlessly waiting for the information about Valtteri Bottas´s condition. I have to say the disappointment was huge when I heard that Valtteri was unable to race today! He hadn´t passed the FIA´s medical test to be fit enough to race so there was going to be only one Williams car lining up on the grid this morning. I really felt for Valtteri, it must have been a massive disappointment for the man himself! He looked absolutely devastated when he sat in the Williams pit garage watching the race. Hopefully he´ll recover soon and will be back at the wheel of his FW37 in Malaysia! Quite a few things happened already before the race actually got underway. Magnussen´s MP4-30 was hit with an engine failure already on the out-lap and the Dane´s race was over before it even started. Red Bull´s Kvyat faced a technical failure as well as he was hit with a gearbox failure and he didn´t make it on the starting grid, either. So there were only 15 cars on the grid starting to the race, which was quite an exceptional situation. About the start then! A lot of things happened immediately when the lights went out at Albert Park. Kimi from P5 got an impressive start behind the Mercedes duo, who both maintained their positions. Kimi, however, braked into the first corner earlier than his team-mate Sebastian and the Iceman was hit by the Toro Rosso driver Sainz from behind. Kimi´s car got into the anti-stall mode and it took a short while until the Finn was back in action. Maldonado in his Lotus passed Kimi and Sauber´s Nasr was determined to execute the same move but Nasr hit first the right side of Kimi´s car and then crashed into Maldonado´s Lotus. Maldonado´s race was over but both Nasr and Kimi managed to continue racing without any major damage in their cars surprisingly! Kimi, however, dropped back to P8 due to this first corner incident. Safety car was deployed due to Maldonado´s crash. Hamilton was leading the race with his team-mate Rosberg 2nd, Massa 3rd, Sebastian 4th, Sainz 5th, Nasr 6th and Ricciardo 7th. Kimi managed to get past Sainz in his Toro Rosso but after that he got stuck behind Ricciardo´s Red Bull. No matter how close Kimi made it to the Australian, there seemed to be no real chance for overtaking! So Ferrari decided to take Kimi in for a pit stop already on lap 17 but the pit stop didn´t go to plan! There were problems with attaching the rear left tyre and it cost valuable extra seconds! Kimi was sent to the track on another set of soft tyres and Kimi´s pace proved excellent. The Iceman started setting fastest sector and lap times. Massa in his Williams pitted on lap 22, which seemed a perfect opportunity for Sebastian to get past the Brazilian. After the pit stop Massa got stuck behind Ricciardo whilst Sebastian had a chance to set a few fast lap times. The German pitted a few laps later and Sebastian rejoined the track comfortably ahead of Massa! Kimi was responsible some awesome-looking overtaking moves today as the Iceman first overtook Sauber´s Marcus Ericsson and after that it was Max Verstappen´s turn to get overtaken by the ice cold Ferrari pilot. Unfortunately Verstappen, who made his F1 debut as the youngest driver ever, also faced a DNF as the Dutchman had an engine failure on lap 34. In the lead there seemed to be no real battle for the victory as the gap between the Mercedes drivers maintained in 1,5-3 seconds throughout the entire race. At some stage Nico managed to decrease the gap but Lewis answered to that right away and didn´t let Nico within the DRS distance. On lap 41 Kimi pitted for the second time for the set of medium tyres. Once again there were problems with the rear left tyre but Kimi was sent back on track. Right after the pit stop it turned out that the rear left tyre hadn´t been properly attached and Kimi had to pull over and retire the race! What a huge disappointment! Pace was definitely there and Kimi would have had the chance to challenge Massa for P4 today! What makes it even more frustrating is the fact that all this was due to the team! Kimi drove perfectly, he couldn´t have done much better in terms of his personal effort. There will surely be a penalty at least for the team for unsafe release but I hope there won´t be any grid penalties for Kimi!! After this crushing disappointment it was all about Sebastian for me. It soon became obvious that Massa was unable to challenge Sebastian for the podium place. For Sebastian this was the perfect way to start the season in the new team! I was so so delighted to see him on the podium! The Mercedes´s 1-2 was so much predicted that there isn´t too much to write about that. Massa finished 4th, Nasr 5th, Ricciardo 6th, Hulkenberg 7th, Ericsson 8th, Sainz 9th and Perez 10th so stunning job from Sauber, which didn´t manage to score any points last season. Button was the only driver to miss out on points as only 11 cars drove to the chequered flag today. The podium ceremony was such a pleasure to watch as the legendary action film star Arnold Schwarzenegger came to do the interviews! It was touching to watch how thrilled race winner Hamilton was about the interviewer. It´s funny because so many F1 fans around the world look so much up to Hamilton and would be stunned if they got a chance to meet him and still there are people who these F1 drivers look up to. The atmosphere on the podium was absolutely great and Schwarzenegger showed great sense of humour by saying to Hamilton that he knows what Hamilton is going to say at the end of the interview: "I´ll be back"! Not many podium interviewers can compare to Schwarzenegger! So now the F1 circus is off to Malaysia in a fortnight. 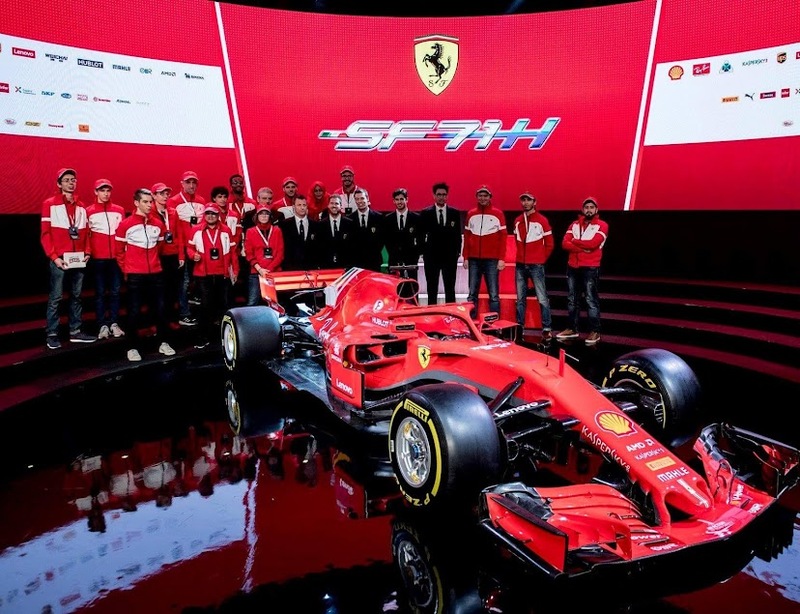 Ferrari have definitely shown that they´re in top form this season so I can´t wait to see what the red-suited drivers will be up to in the heat of Malaysia!